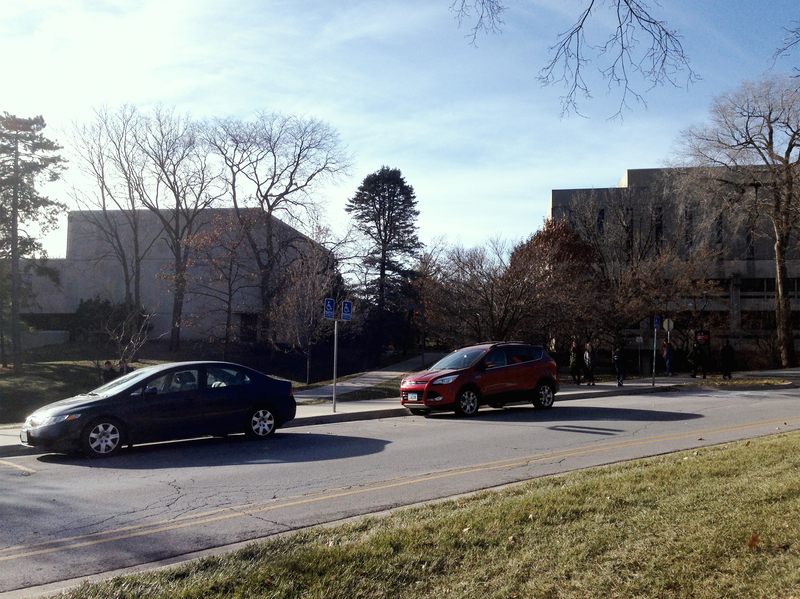 Iowa State University's Music Department has significantly outgrown their existing building. About 1,800 students are involved with its activities (5% of the campus, or 1 in 20 students). 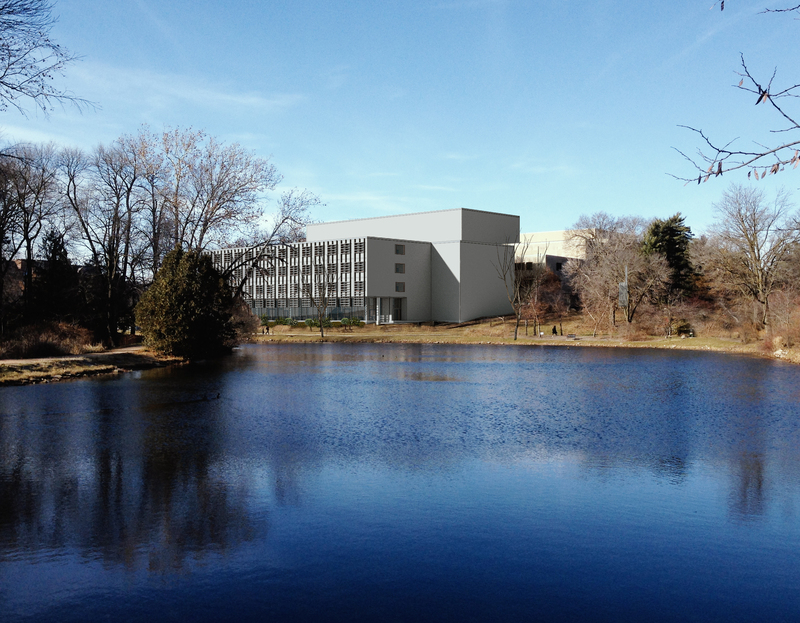 The existing building has two main rehearsal spaces, one for bands and orchestra and the other for choirs, which both perform in a 300-seat recital hall. 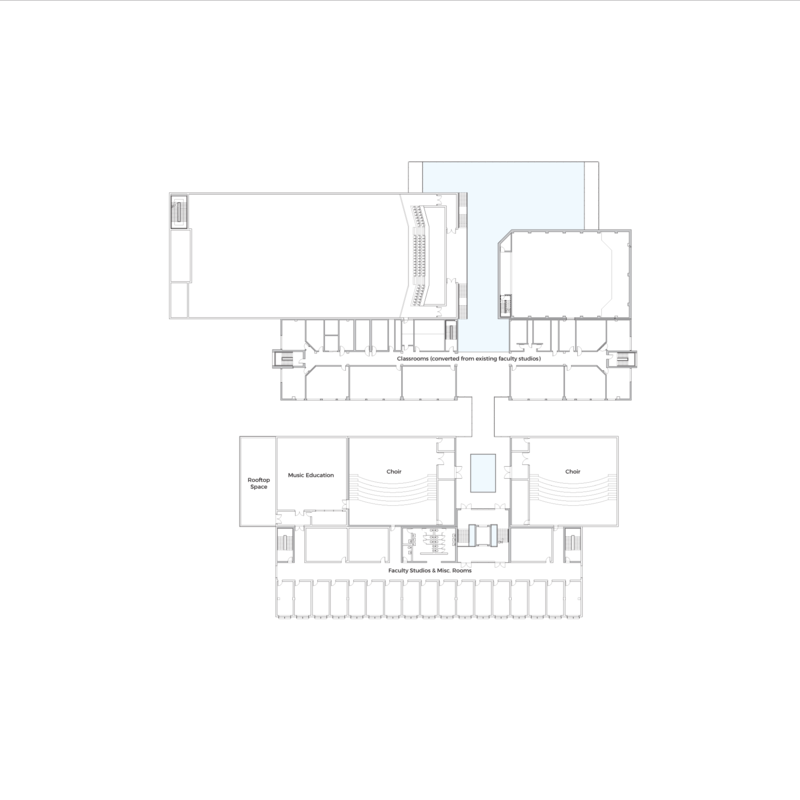 The rest of the building is comprised of faculty offices, classrooms, practice rooms, and storage. Every room is occupied at almost all times of day. After interviewing the Music Department faculty on their needs (and by the guidance of their facilities director Lawrence Curry), it was determined early on that this addition would effectively double the square footage of the building: Four rehearsal spaces minimum, a 1,000-seat orchestra hall in addition to the existing recital hall, and additional classrooms, faculty offices, practice rooms, and storage. Also requested were spaces for a potentially expanded music education program, as well as a performance space for experimental electronic music. The existing building is divided into three main programs: Practice, rehearsal, and performance. This division is quite literal, with each set of rooms built on a separate foundation for acoustic isolation. Yellow is practice, red is rehearsal, and blue is performance. Our intervention begins with relocating the existing rehearsal spaces. 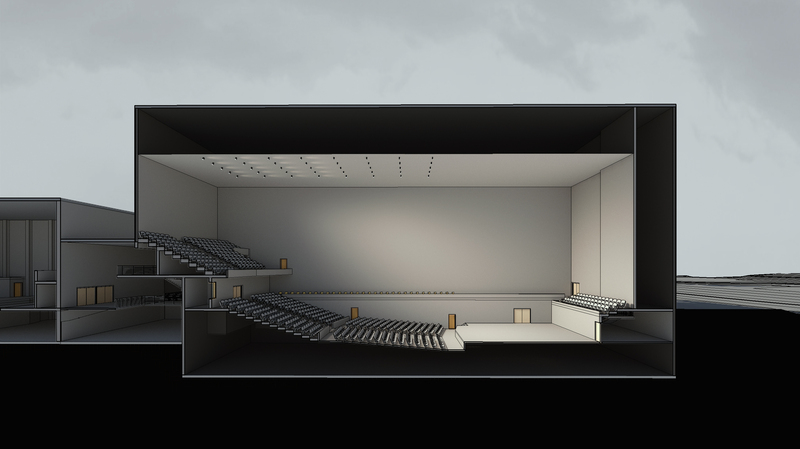 The new 1,000-seat orchestra hall goes in this spot, allowing both performance spaces share the benefits of a new lobby. This new lobby also helps with visibility of the building, with the main entrance becoming more immediately obvious as well as reachable by automobile (which it previously was not). 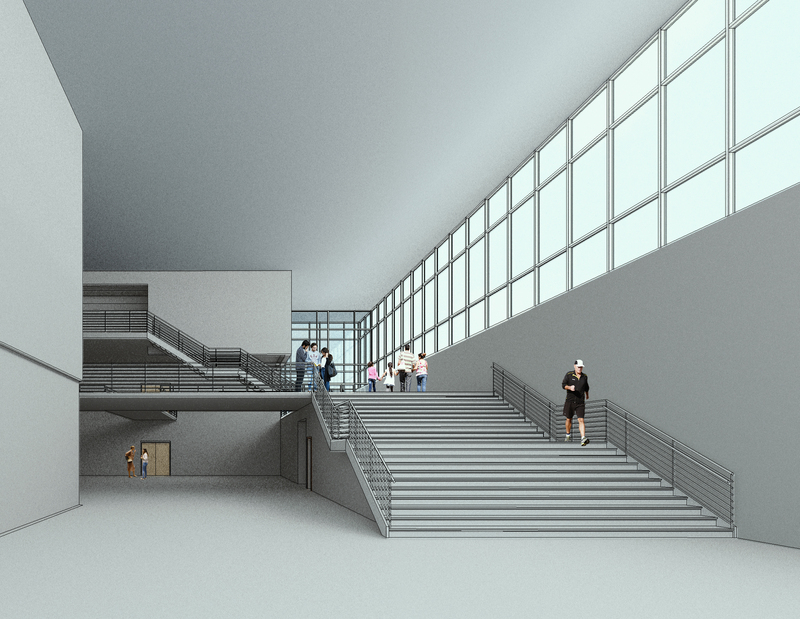 The new lobby also acts as a public way, replacing a long slope of sidewalk (which was dangerous when icy in Iowa's long winters) with an interior set of stairs. Northeastern corner of the building as approached from the east, before and after the new lobby. Interior of the lobby after entering, looking west. Stairs bring pedestrians up a level to replace the original slope of sidewalk. The number of rehearsal spaces is then doubled. Lower rehearsal spaces for band and orchestra are at-level with the backstage of the orchestra hall, ensuring the movement of percussion equipment is as easy as possible. Upper rehearsal spaces are for choir. 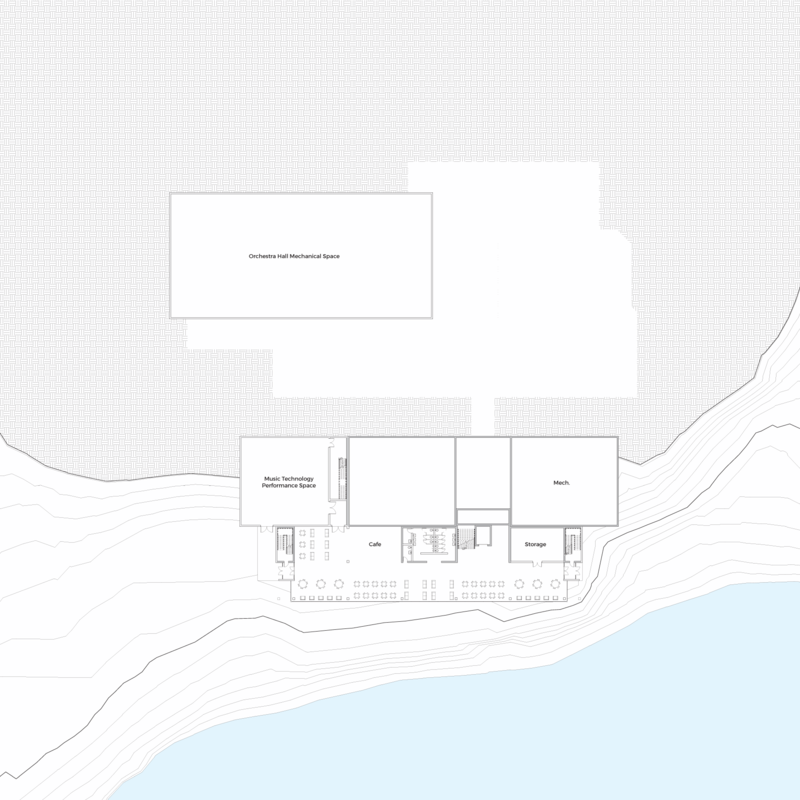 Two additional spaces of the same size are added to the west, the lower for electronic music and the upper for music education. 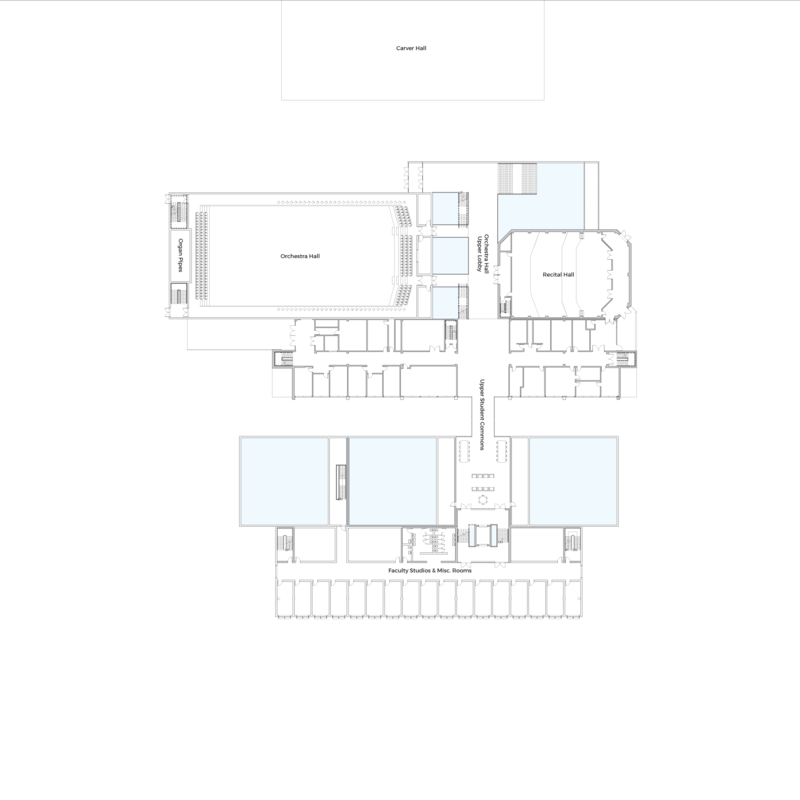 Last, a bar of faculty offices, classrooms, and practice rooms are added to the south. Existing facilities of this kind in the original building had a direct view to the lake on the south, and they are all relocated into the new bar in order to maintain that view. The bottom level of this bar is a public space with seating for eating and also serves as a lobby to the electronic music performance space. Interior of the bottom level public space, with the lake on the left side of the image. 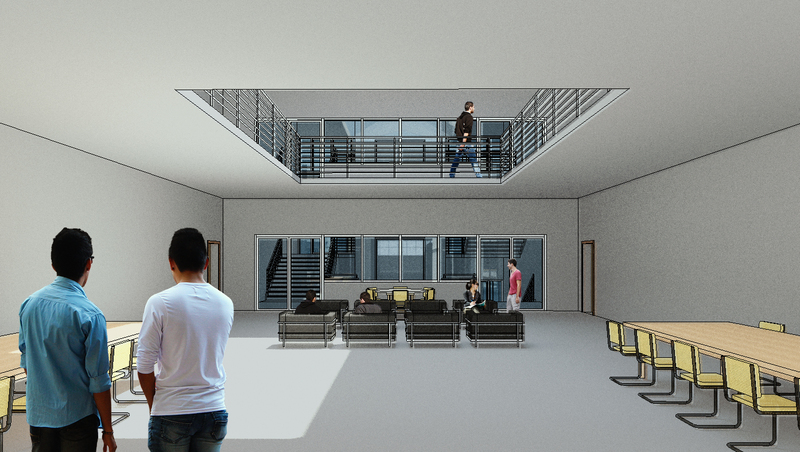 Perspective and section of a new student common area, which is located to join all four rehearsal spaces together. 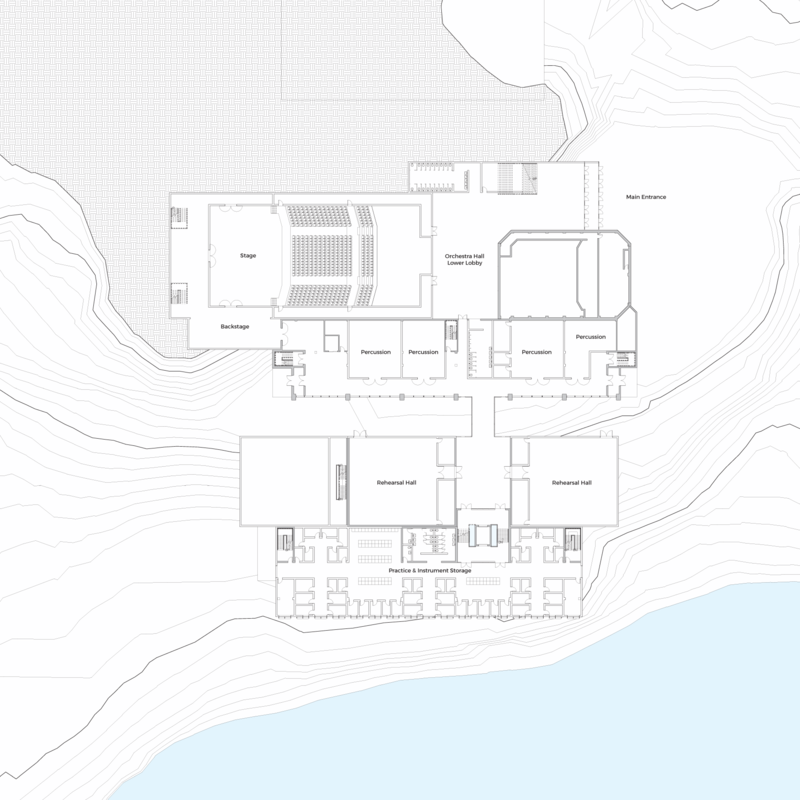 Music technology and education spaces are also shown in this section to the right, matching the massing diagram from before. 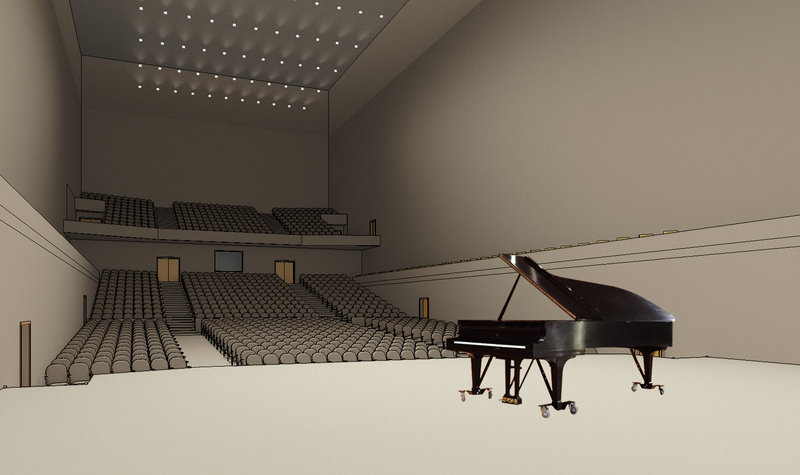 Perspective and section of the 1,000-seat orchestra hall. The audience enters and exits from three levels in order to maximize traffic flow. Fixed choir seating behind the stage can become audience seating when there is no choir. Section of the full project, facing west. To the right is original building (with the new lobby) and to the left is the new addition. The two are joined by a series of glass-walled walkways. The gap between the two complexes is green space.